PetBox, Inc., a monthly subscription service delivering a personalized box of premium toys, treats, and accessories to dogs and cats each month, is pleased to announce a new partnership with BOGO Bowl to help feed shelter animals nationwide. “We are excited to have found such an outstanding partner in Bogo Bowl for our #PetBoxFridays campaign,” says Will Ford, co-founder and president of PetBox. PetBox, Inc., a monthly subscription service delivering a personalized box of premium toys, treats, and accessories to dogs and cats each month, announced today that it has teamed up with BOGO Bowl, a premium pet food brand that donates a bag of pet food for every bag purchased. Through the new partnership, BOGO Bowl will supply and distribute dog and cat food to shelters and rescues selected via PetBox’s weekly social media campaign. Each Friday, PetBox sends out a request for nominations and votes via social media to determine which animal shelter or rescue will receive the donation of dog and cat food. Through a variety of online platforms, users nominate and vote on a shelter or rescue using the #PetBoxFridays. On the following Monday, the donation of pet food is sent directly to the chosen organization. With the new support of BOGO Bowl, a premium pet food brand, shipments of BOGO Bowl’s high-quality dog and cat food will be sent directly from its Iowa headquarters to the chosen animal shelter or rescue each week. PetBox and BOGO Bowl share the costs of this partnership, with a concerted effort in this altruistic mission. 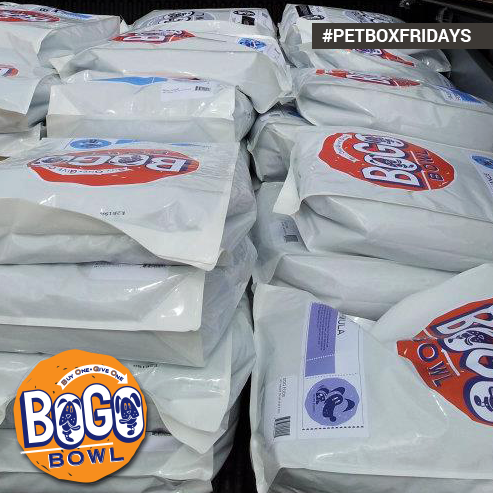 PetBox is thrilled to coordinate their efforts in giving back to communities nationwide with BOGO Bowl. “We are so excited that we found such an outstanding partner for our #PetBoxFridays campaign. Thanks to our new partnership with BOGO Bowl, we are now able to give back even more to shelters and rescues nationwide,” says Will Ford, co-founder and President of PetBox. “We were delighted to find that PetBox shares our philosophy that all pets – whether in homes or in shelters – deserve happy, healthy lives, so we’re very pleased to enter this partnership and look forward to doing great things together for animals,” says Sara Henderson, founder and Chief Foodie of BOGO Bowl. Through donations of dog and cat food from PetBox and BOGO Bowl, animal rescues and shelters can redirect funds previously spent on pet food towards necessities like medical care, facility improvements, and other vital needs of resident dogs and cats. A rapidly growing e-commerce and technology startup, PetBox is a lifestyle brand that was founded in 2013 and is based in San Diego, California. Led by a team of true animal lovers, PetBox provides premium products to the most discerning pet owners on a monthly basis. With an emphasis on pet health, the company’s experts curate a collection of all-natural toys, treats, and accessories for cats and dogs. For more information, please visit http://getpetbox.com. For each PetBox shipped, the company feeds one rescue or shelter animal. Follow #PetBoxFridays to keep up with the PetBox community as they send shipments of dog and cat food each Friday to shelters and rescues across the United States. BOGO Bowl, based in Des Moines, IA, is a rapidly growing e-commerce company that believes in select ingredients for healthy pets both in homes and in shelters. Operating on the “buy one, give one” approach, each purchased bag of BOGO Bowl brand pet food results in a bag of the same quality food being donated to a pet shelter, rescue or pet food pantry. BOGO Bowl helps to keep family pets in their homes, and to give rescue pets the time they need to find the perfect family. For more information, please visit http://www.bogobowl.com/.